Commander of the Islamic Revolution Guards Corps (IRGC) Aerospace Force Brigadier General Amir Ali Hajizadeh announced that the IRGC’s combat-bomber drones make the biggest fleet in the region. “Today, the IRGC is in possession of the biggest bomber-combat fleet in the region,” General Hajizadeh told reporters on the sidelines of massive drone drills by the IRGC in the Persian Gulf region on Thursday. He said that a part of the drills has been dedicated to designing and planning for the concurrent flight of drones in a very limited geographical region, Fars News Agency (FNA) reported. “The drills are a strong slap on the face of the arrogant powers and remind them of the results of their presence in the region at high costs,” General Hajizadeh said. During the drill on Thursday, the IRGC Aerospace Force flew tens of Unmanned Aerial Vehicles (UAVs) toward a target on a small island in the Persian Gulf. The squadron of the aerial vehicles, including 50 Iranian versions of the US RQ-170 Sentinel stealth drones, took off from bases as far as a thousand kilometers away from the operation zone to bomb the target. The 50 domestic RQ-170 drones and a number of other combat and bomber drones attacked a spot on Bani Farur Island in Iran’s territorial waters in the Persian Gulf. All the aircraft in the wargames successfully bombed the target at the same time. The wargame was attended by IRGC Deputy Commander Brigadier General Hossein Salami, General Hajizadeh and Commander of the Khatam al-Anbia Headquarters Major General Gholam Ali Rashid. General Rashid told reporters that the large-scale exercises with such a high number of home-made drones, should humiliate the enemies who want to mar the country’s integrity. Iran currently possesses the biggest collection of captured or downed American and Israeli drones, including the US MQ1, MQ9, Shadow, ScanEagle, and RQ-170 as well as the Israeli regime's Hermes. Iran grounded the RQ-170 drone in December 2011 using electronic warfare techniques, as the stealth aircraft was flying over the Iranian city of Kashmar near the Afghan border. According to the IRGC Aerospace Commander, Iran used the reverse-engineered version of the RQ-170 drone to target the ISIL positions in Syria and Iraq. 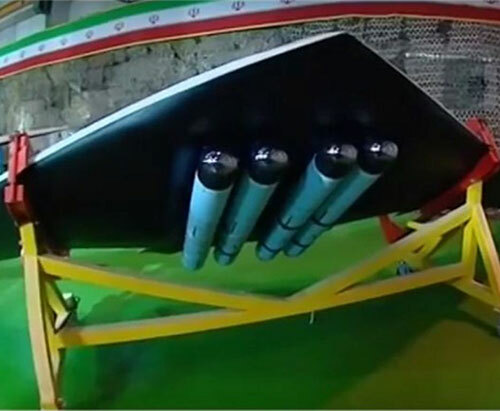 The Israeli drone, Hermes, was intercepted and shot down in October 2014 by the IRGC forces on its way to the Natanz nuclear facility in the central Isfahan province. General Hajizadeh had earlier said that in the field of Unmanned Aerial Vehicles, Iran is now one of the world’s top four or five countries, and the first drone power in the region.